Despite problems with the Vikramaditya and Moscow’s failure to win several recent Indian tenders, the military and technical cooperation between Russia and India can rather be called more successful than disappointing. In November, some newspapers reported that Moscow had lost its fourth Indian tender in a row, this time to supply Il-76KMI refuelling planes. The Indian Defence Ministry opted for the European A-330MRTT. Earlier the Russian multi-purpose MiG-35 fighter, the Mi-28NE helicopter gunship and the heavy transport helicopter Mi-26T2 lost tenders to the French and twice to the Americans. The fact that the heavy Mi-26T2 lost to its rival, CH-47F Chinook, was a surprise. Many remember that in 2009 an American Chinook shot down in Afghanistan was evacuated by a Russian “Mil” on its undercarriage. US President Barack Obama gave thanks to our airmen for this. And now such an embarrassment! $1 billion Indo-Russian defence deal in pipeline? The organisers of the tender did not say whether their choice was dictated by greater efficiency, lower price or streamlined production process or any other advantages of the rivals. There was always something which remained unsaid – which arouses suspicion that some members of the tender review commission or others were biased. That said, Russia has no complaints towards India. Our arms and weapons manufacturers cannot complain of that country’s unfairness. Just under half of the entire export figures for the Russian arms industry are attributable to the Indian army and navy. It will be recalled that several months ago Moscow handed over to the Indian Navy its Project 971 Shchuka-B K-152 nuclear submarine called Nerpa and now renamed Chakra. Incidentally, no other country has ever previously handed over a nuclear submarine to any of its allies, not even on lease. Russia and India are not allies, just partners in military-technical cooperation. Indian defence plants produce the multifunctional Su-30MKI jet fighter and T-90C main battle tanks under Russian licence. And again, one cannot help recalling that not a single country with which India has military-technical cooperation has ever sold a licence for the production of military hardware supplied to India. Even AEDS who won the tender to supply 126 Rafale fighters, and in accordance with the tender terms was obliged to offer a licence for the production of the plane at Indian plants is trying to sidestep or alter that provision. This has delayed the signing of a contract between Paris and Delhi, bringing into question the French victory in this tender. Russia’s Sevmash shipyard in Severodvinsk continues refurbishing the Vikramaditya aircraft carrier cruiser for the Indian Navy. The story of this cruiser may seem to provide the answer to why Russian arms manufacturers have recently been losing tenders to their rivals – what with the endless delays to the building of the ship which broke all the agreed schedules; the effective doubling of the cost of the contract when it was already being fulfilled; and difficulties with the ship’s boilers that were only revealed during tests last autumn. All this is really true. But it has to be said, for the sake of balance, that the Indian partners share some of the blame for the woes of the Russian shipbuilders. It was clear from the outset that such a huge and sophisticated aircraft carrier could not be refitted for $1.5 billion (half of which went to pay for the fighter planes on deck). Besides, India’s refusal to have the boilers insulated with chrysolite asbestos – the traditional method in Russia – on the grounds of it being an alleged health hazard, and insistence that it be replaced with fireproof brick, caused further delay in the handover of the ship to the Indian Navy, according to Andrei Dyachkov, director of the United Ship-Building Corporation. Today these ill-fated Chinese-supplied bricks – which could not withstand the boiler temperature – are being replaced with asbestos agreed with the Indians. The ship-builders promise that the Vikramaditya will be handed over to the customer by the end of 2013. And yet despite the problems with the aircraft carrier, and Moscow’s failure to win several of the recent tenders, the military and technical cooperation between Russia and India can be called more successful than disappointing. What we saw and heard at the 12th plenary session of the Russian-Indian Intergovernmental Commission for Military-Technical Cooperation in October sounded optimistic – although of course the two defence ministers and their colleagues from foreign trade organisations and defence firms also spoke about the problems that have piled up. It was decided that the Vikramaditya would be handed over before the end of 2013. Before the end of 2012, India and Russia intend to sign a contract for the delivery to Delhi of 42 multi-purpose Su-30MKI fighter planes. It’s not inconceivable that this may happen during President Putin’s visit to India. 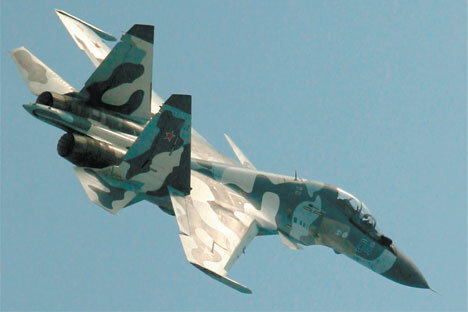 The Indian Air Force has already bought more than 230 such planes from Russia. Almost a hundred of them are already in operation over India. The remaining 140 are to be built at plants of the Indian HAL corporation before the end of 2015. These contracts secured $8.5 billion for the Russian economy. Earlier the general director of the Irkutsk Aviation Plant (part of the Irkut Corporation), Alexander Veprev, announced that part of this consignment is complete, and he expects that a contract could be signed any day now. The estimated cost of the deal is $3.77 billion and deliveries are due to start in 2014-2015. Another ground-breaking project is joint production of the BrahMos supersonic anti-ship missile. Since the start of the project, India received more than a thousand such missiles, which are already part of India’s coastal defences and are installed on Project 11356 frigates the Yantar shipyard in Kaliningrad has built, and continues to build for the Indian Navy. Each frigate carries 16 such missiles. The first ship in this series, the Teg, has already arrived at the Mumbai naval base and the second, the Tarkash, is due to arrive soon. A third ship will be delivered next year. First Deputy General Director of the MIC NPO Mashinostroyenia, Alexander Dergachev told me at the international arms exhibition Africa Aerospace and Defence 2012 in Pretoria that Indian experts, inspired by the performance of the BrahMos missile, want to fit it under the fuselage of the multi-purpose Su-30MKI fighter plane. He said the missile is practically ready. It remains to get the go-ahead for its tests from the Sukhoi firm and other enterprises whose equipment the plane carries. Indian experts want to put this missile on diesel-powered submarines which Russia may build for India if it wins the tender, Dergachev says. The underwater missile has a range of 300km. But “it will be a vertical launcher with mortar-type start, the launch shaft using gas generators that push the missiles with compressed powder gas, and it develops a Mach 2 speed during its trajectory,” he explained. Drop tests of the underwater BrahMos from a submerged platform in the Indian Ocean are scheduled. If the experiment is successful, the missiles will be used by the diesel submarines Russia supplies to the Indian Navy, Dergachev said. BrahMos is not the only instance of joint development and production of weapons between India and Russia. One may recall the fifth-generation fighter plane (PAK FA) Russia is co-developing, and whose tactical and technical characteristics have been approved by the Indian Defence Ministry. The first flight of the Multi-Role Transport Aircraft, due to replace Soviet-era An-12 and An-26 in the Indian market and even in the markets of third countries is scheduled for 2016-2017, with serial production to begin in 2019. Add to this the joint production of RSZO Smerch rockets we have supplied to India and some other projects and it becomes clear that in spite of the Indian Government’s law on diversification of military procurement (in line with the “don’t put all your eggs in one basket” principle) so as not to be dependent on any single supplier, Russian arms are preponderant in India today, and will be tomorrow too. However, we should not entertain any illusions. Breathing down our necks are persistent, active and strong rivals who have some supporters in the Indian government. Even so, we have a fair chance to have more effective and intensive military-technical cooperation with India. New projects include air defence systems, modernisation of planes and helicopters for the Indian Air Force, notably the MiG-29 fighter and Mi-17 helicopter, refitting of T-72 and T-90S tanks which are the strike force of the Indian army, along with many other projects. There is still a chance to win the tender to supply 197 reconnaissance and observation helicopters to India, for which the Italians and Americans are also bidding. But our position is strong enough because we are offering our light Ka-226T helicopter which made a good showing in the Indian mountains. Along with the chopper we are offering a massive offset programme, including licensed assembly of these machines at local defence enterprises. A very well-informed expert, Russia’s former ambassador to India and former head of the Foreign Intelligence Service, currently member of the RAS IMEMO institute directorate, Vyacheslav Trubnikov had good reason to promise to the recent Russian Presidency of APEC and New Prospects for Russian Integration in the APR forum that Moscow would supply $14 billion worth of military hardware to Delhi by 2015. But leaving aside starry-eyed optimism one has to admit that if we are to score new victories in tenders to supply to India new types of military hardware and weapons we must overhaul our defence industry. That work has already started. Much hinges on its success. Not only our country’s security, but the security of our partners of many years standing in military-technical cooperation.